What Would Jizō Do? And Who is He? If you want to see a representation of a kami (deity) in Japan, all you need to do is pop into a dusty temple or sacred shrine. I’m talking about that mysterious red-cloth-wearing stone statue that we have all seen everywhere around Japan. Who is that and why should I care? Jizō, or Ksitigarbha as he is known outside of Japan, is a Bodhisattva. As an enlightened follower of Buddhism, Jizō helps others reach Paradise by finding peace in their own lives. His influence in Japan came with Buddhist teachings from China and Korea, which in turn originated from India. Jizō is usually referred to as taking a male form, but there are a few Jizō statues around Japan that feature female forms. He is most famously known as the protector of children. In the past few decades he has also been referred to as the guardian of children lost in child birth or miscarriages. When children die, they become trapped in the underworld. A dead child is too young to have accumulated good karma to make it to the Buddhist Paradise. He or she has left parents in a negative state from the hardship of 9 months of pregnancy but nothing to show for it. Children’s spirits become trapped in an underworld, represented by a river of flowing tortured souls. Children do their best to stack rocks and pebbles in order to climb out of the abyss, but it is never enough. Demons attack and push over the piles or the exit of the abyss never seems to get closer–no matter how much one builds. 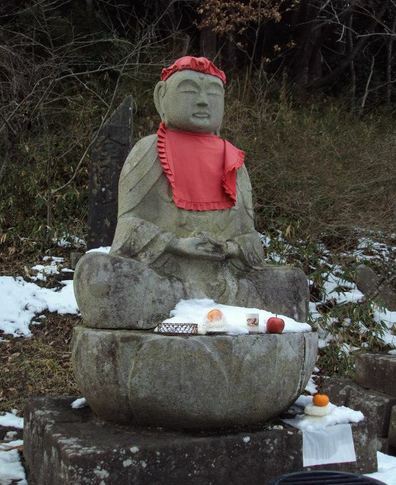 When parents or community members place stones next to a Jizō statue, they are hoping their children or Jizō himself will help use it to ford the river of lost souls. Jizō not only has the power to rescue and protect children from defilement in death, but also illness in life. Another key feature of Jizō statues is their red clothing. The color red in Japan has long been associated with illness. Those with diseases, such as small pox wore red as perhaps a kind of warning to others of the infectious disease. People taking care of them also wore red. Since those helping the sick also wore red, the imagery of illness slowly changed. Instead, expelling illness, as well as demons or evil spirits for that matter, became the new association. There are distinct clothes Jizō wears. A Japanese gentleman told me Jizō wears bibs so the children can eat in the afterlife. The statues are dressed with hats so they can stay warm. The exception is that Jizō seem to be fashionable among other kami statues in Japan as I have come across some wearing different colors or wearing scarves during the winter months. 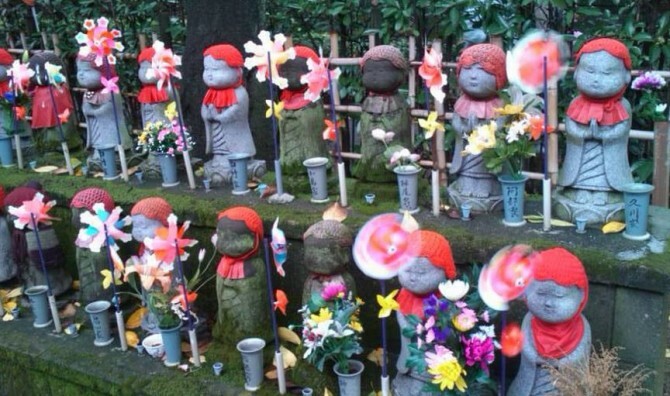 Jizō are commonly found in cemeteries or even along travel routes. They point you in the right direction in life, or in the afterlife. Jizō statues are well respected and loved by Japan. It is not rare for families to buy statues of Jizō to put in gardens around their house. As one of the most recognizable symbols in Japan, I felt embarrassed for not learning about Jizō earlier on. It shows that no matter how long you live and study Japan, there is always something new to learn right in front of your eyes. I’ve always wondered what the symbolization was behind this. Thanks for explaining with this article!